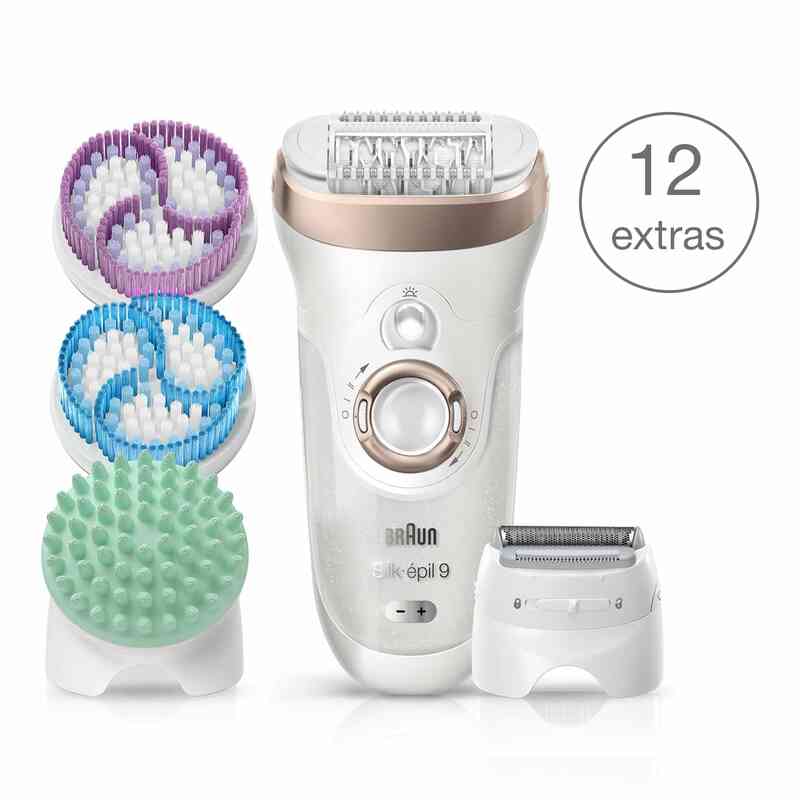 Silk-épil 9 SkinSpa 9-961V Wet & Dry epilator with 12 extras incl. 3 exfoliation brushes. Braun Silk-épil 9 SkinSpa. The best 4-in-1 epilation & exfoliation & deep massage system. Braun Silk-épil 9 SkinSpa has a 40% wider head removing a lot more hair in one stroke for a faster epilation. A new standard of epilation so you can enjoy long-lasting smooth skin for up to 4 weeks. Efficiently removes hair by the root for long lasting smoothness. With pulsating active vibrations - for an extra gentle epilation. Smoothly adapts to body contours for superior comfort and efficiency. Works in bath or shower for a more comfortable epilation. Visibly refines skin with 3000 micro-vibrations per minute. With 10.000 fine bristles gently removes dead skin cells and stimulates skin regeneration. Charges in only 1 hour for 40 minutes of use. Use cordless in shower or bath. Smoothly adapts to your body contours. Easily clean under running water, comfortably use in bath or shower. Silk-épil epilators recommended* as the gentle solution to long-lasting hair removal thanks to its unique combination of skin-soothing features. Massages your skin noticeably deeper than a standard body brush. The effect is improved blood circulation which helps to visibly improve the skin appearance. Shave and trim for sensitive areas. its all amazing and i wanted to get a new one,,, but i am not sure this one is golden coulour or the white transparent one ? Best one i have used in years! Easy to use, been using it both wet and dry and every time works a treat, this has to be the best epliator i have used in years.